If your passion is River & Lake Fishing then you can experience the perfect angling holiday in Connemara. 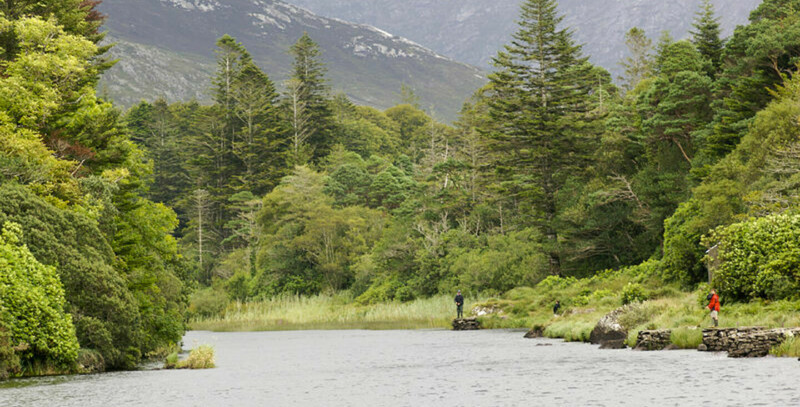 Connemara offers access to some of the best privately-owned salmon and trout fishing in Ireland, both on river and lake, and indeed several of them own complete river systems. There are several fisheries for you to choose from some of which are listed below. The Culfin Fishery is situated 6 miles west of Leenane and is comprised of the Culfin River, Lough Muck and Lough Fee. Access to the fishery is easy as the Leenane-Tully Cross Road runs along the shore of the lakes and close to the river in several places. Kylemore Abbey Fishery is located between the mountains of Connemara and the Atlantic ocean. The open panoramas of the lakes contrast with the intimacy of the river to give a variety of fishing combined with stunning scenery unrivalled anywhere in Ireland. Lough Inagh Fishery consists of two Loughs, Derryclare and Inagh, lie in the lovely Inagh Valley with the Twelve Pins (Bens) of Connemara rising steeply to the west, and the Maumturk Mountain range to the east. The fishery has spring salmon, grilse, sea trout and large indigenous brown trout. There are three sets of ‘Butts’ or long fishing piers, built out onto Derryclare Lough for the anglers convenience. Stay with us at the 4 star Connemara Coast Hotel when taking a fishing break in Connemara.